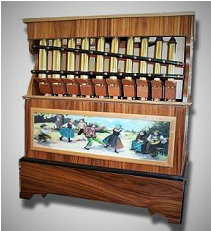 We currently have available in stock this new small hand turned pipe organ which plays on the standard 20 note paper roll scale. The organ contains 20 pipes, operated on traditional bellows. You simply insert a roll and turn the handle to play. Each roll usually has between 3 to 5 tunes and you can purchase extra rolls to enable an almost endless library of different music. 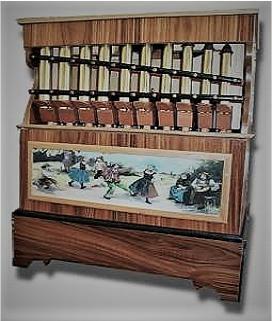 The organ has a veneered case with brass pan pipes on show and a traditional print picture below, manufactured in Europe, a very portable compact instrument offering a good musical performance and traditional tone. Approx size 390 x 300 x 450mm. Approx Weight 9.6Kg. 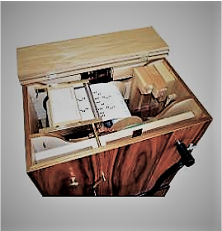 Order Code: BO 1 (Organ & 1 Paper Roll) £3100.00 Ex Works Bristol, Inc V.A.T. 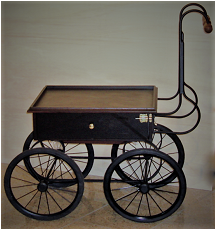 An organ cart for transportation can be supplied at extra cost if required. For extra music for this model please have a look at our latest music list HERE.